Not much left to see in this town, as there aren't that many tourist attractions beyond the beach and shopping. These are such a great idea, people have one or more for lunch or a snack, as they are available all day. Much nicer than having to eat a large plateful!! But they're run on the honesty system, and for many westerners that's a foreign concept. We shopped for a couple of hours, but many shops were shut for the lunch break (usually from 1 to 4) so we went back for a rest and ventured out again around 5. After more shopping and a walk to the Maria Christina bridge across the river (photo coming later via JP) we went back to the Pizza Cafe for dinner. 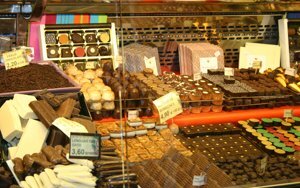 We ordered up big to show J how wonderful it all was, and once again waddled back to the pension and bed. Sadly, across the street is a disco, and tonight it was on. Starting at 3am. It wasn't the music that was the problem, it was the 200 or 300 young people gathered in the street talking laughing and cavorting around until the disco closed at 6.00am. Sigh. 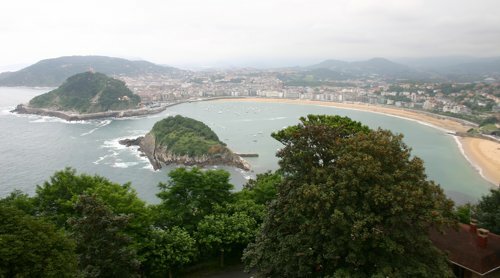 Since we felt that the coffee shop we went to yesterday afternoon late, on the recommendation of our lovely hostess, left a little to be desired in friendliness, this morning we had our breakfast at another one up the Urbanieta, the main street of the lower part of San Sebastian. 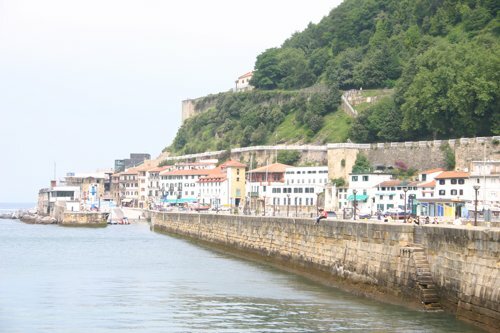 SS is a small town, with the sea at the northern end and a river dividing the town. 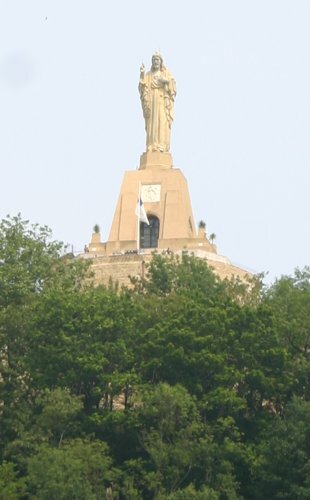 The old Town is at the northern end, around the harbour and a small mountain/high hill (on which stands a statue of Jesus blessing the town, but much smaller than its counterpart in South America). The newer suburbs are across the river. The shopping precinct lies south of the Old Town, and our Pension is about 1km south of the Old Town, towards the end of the shopping precinct. 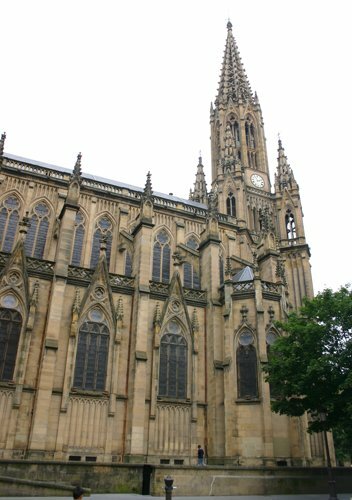 I have to say that I liked San Sebastian, even though 3 days there was enough unless you're in a shoppping frenzy. It reminded me of a French provincial city, very attractive, clean, sophisticated, good shops, well-dressed citizens, parks, gardens and trees everywhere, a picturesque harbour and a lovely long beach as well. We walked around the the beachfront and along to a restaurant recommended by our lovely hostess, quite a way along, almost to the end of this photograph. The restaurant was called La Perla and it was very nice indeed. Fish, though... I had an entree of a puff pastry parcel of vegetables, and JP had a wonderful dish of zucchine stuffed with meat and vegetables. J had a rice and octopus entree that was very tasty but very filling. I had a baked fish, JP had the entrecote, not being a fish eater, and J had a whole fish (sorry cannot remember more details!). Dessert was vodka and mandarin icecream for J, and JP and I passed. We left and continued our walk to exercise off our lunch. All the way around the beach to the mountain on the other side, Monte Igueldo. There's a 4 star hotel on the top and an old (old!) funfair. 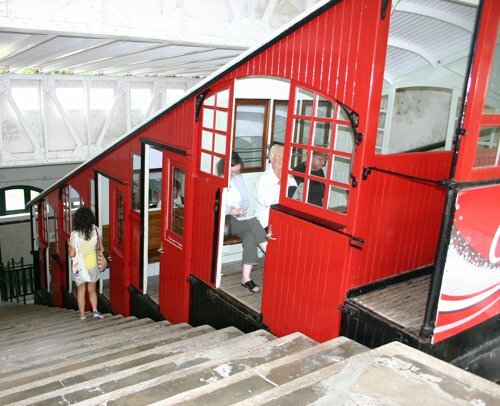 And to get to the top you can drive or take the funicular. Guess which way we went up!! We began the loooooong walk back. On the way we saw a man writing in the sand 1512 - 2012. 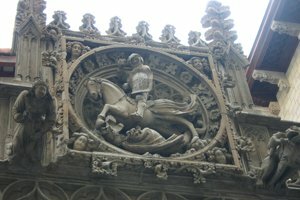 1512 was the year that San Sebastian was built. As he was a perfectionist we didn't stay to see what else he might be writing! We had a rest and recuperate before heading out for dinner. J wanted to eat early and get back in time to watch Euro2008, so we found a cafe and he had a steak and chips while JP and I had a drink. He left us then, and JP and I wandered around looking for a place to have a drink and a bite. We found a cafe with the unprepossessing name Le Pizza Cafe, but it was great. Friendly staff, modern and clean. The counter had 'toothpicks' on it but the menu had a section called Rationes, and we soon realised these were the sort of tapas we'd eaten in Barcelona. So JP and I ordered a bunch of them - patatas bravas, olives, calamari, ham croquettes, and the special spanish bread called pan bagnat - bread rubbed with a cut tomato. These were some of the best tapas we ever had. AND they had Euro2008 on the tv!! After stuffing ourselves we waddled home to the last 30 minutes of Euro2008 (Spain won its semi-final) and bed. 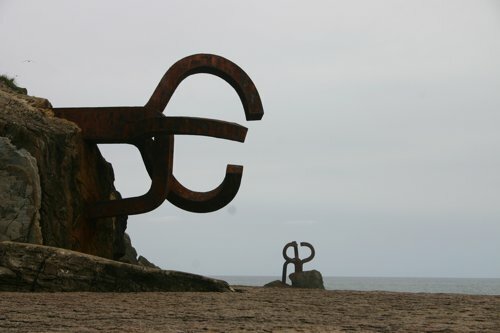 We left Barcelona early today, as it is a long drive to San Sebastian, over on the Atlantic coast. It was very warm, over 33 as we left the town at 10.30. 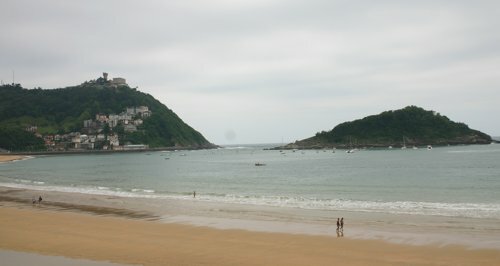 We stopped a couple of times on the motorway, and finally pulled into San Sebastian around 5pm. After driving around the city a couple of times we found the hotel. We dragged our luggage from the carpark a block away. 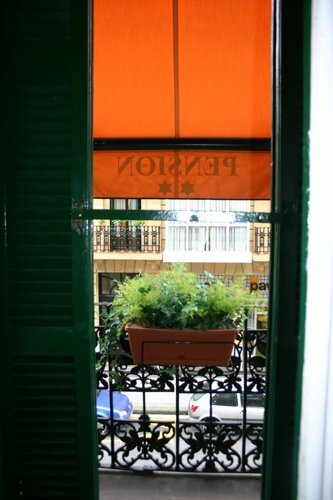 We are staying at Pension Bellas Artes, and it is a lovely small family run hotel where the people are unbelievable kind and generous. They gave us a map and drew on it the restaurants we should try, where to get coffee, where to see the sights, where to take photographs.... nothing was too much trouble. 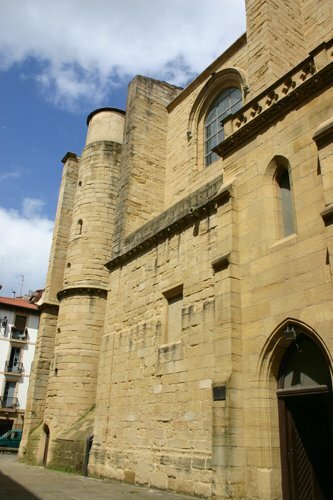 JP and I headed out for a coffee while J unloaded and parked, then after we unpacked we walked up to the old town. No camera so you will need to read tomorrow's entry to see what it's like! We went to a tapas bar recommended by the ladies at the Pension. We were used to tapas in Barcelona, where you order small dishes of food and they are brought to you. 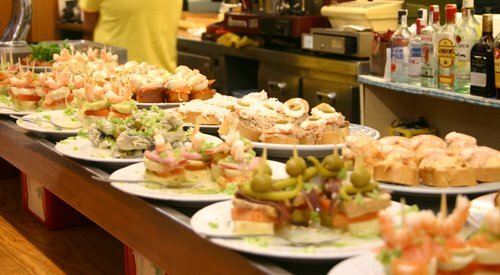 Tapas in San Sebastian is different - we called it 'toothpicks'. The bar of the establishment is lined with plates, and each item on these plates has a toothpick in it. You get an empty plate and you help yourself from the selection on the bar. These can range from artichoke bottoms piled high with smoked salmon or jamon, egg halves covered in crab, rounds of toast high with tuna and anchovies, toast with crab, toast with jamon, toast with torta (potato cake), rounds of bread with egg and anchovies, small bread rolls with jamon or tuna or torta - the list goes on, usually at least 20 different offerings. Usually people get a drink and 1 toothpick, so I think they were a little surprised when we ordered a drink and piled our plates high with selections!! But that was dinner for us, not just an aperitif. 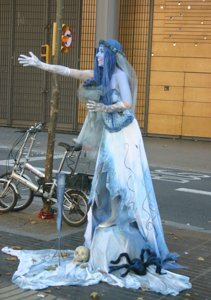 Very interesting and different, then we walked further into the old town and came to the sea. We walked towards the harbour, and ended up walking around the back of the headland!! J headed back for Euro2008 (Germany won), so JP and I found a cafe and had a revivifying drink before wandering back to the pension and bed. 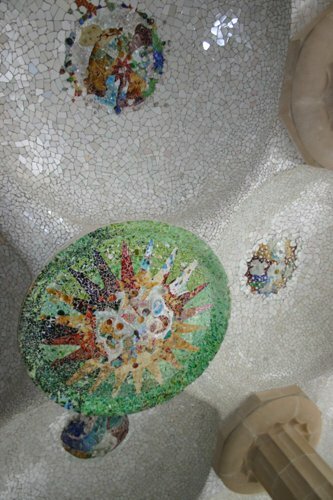 I apologise in advance for the length of this post, but I wasn't prepared to be as blown away by Gaudi as I was!! 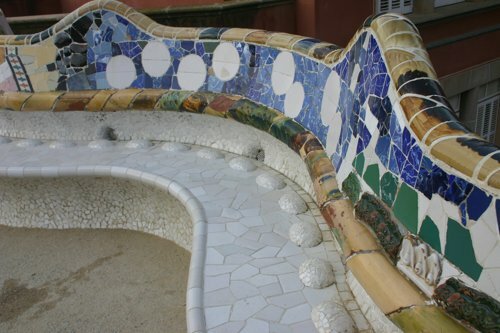 and finally on to Park Guell. 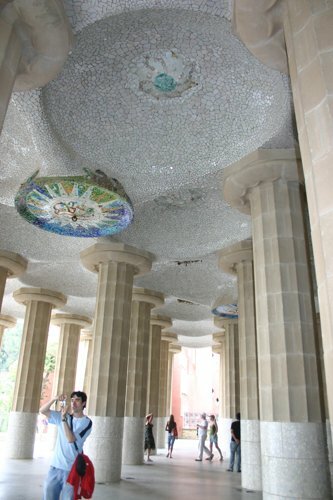 Gaudi designed and built this park as a whole lifestyle development, complete with walks, conversation spots, a gathering place for the inhabitants, a covered marketplace, views, drainage - everything people could want. And they stayed away in droves. 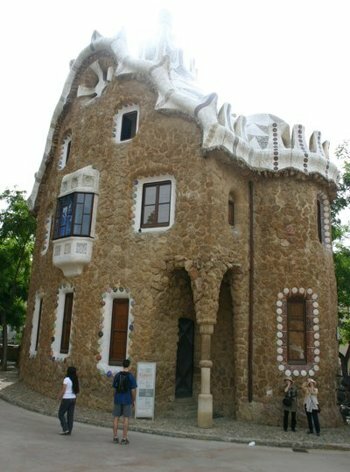 Only 2 people took up the land and housing offer - a lawyer whose family still lives there, and Gaudi himself (with his niece and brother, as he never married). 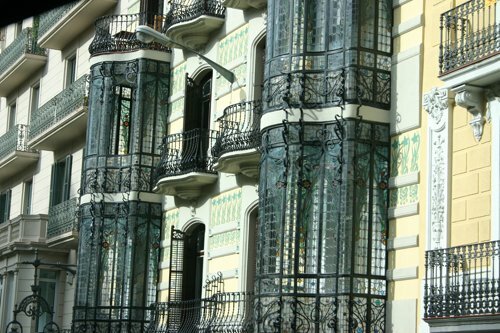 People were buying up cheap houses in Passeig Gracia, closer to Barcelona, so it never took off. 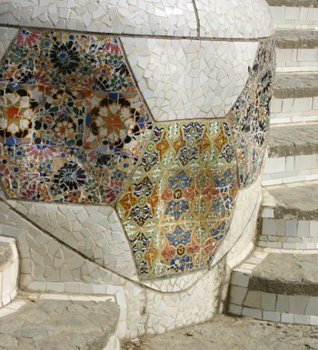 To the benefit of the city, as Guell's heirs later donated the entire park to the city, and it became the public space it is today. 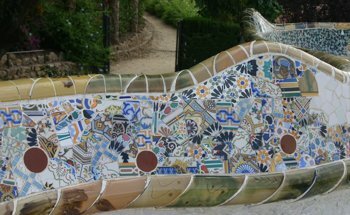 of course everywhere the mosaics are different, fabulous colours and an amazing artistic vision, concept, integrity - words can't describe how beautiful it all is. 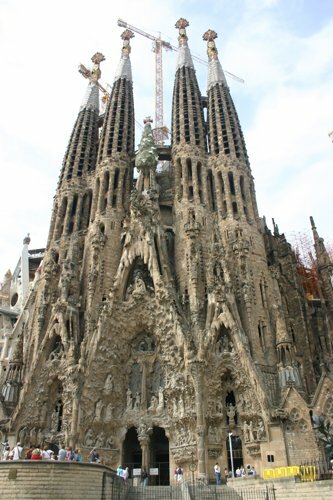 We then got back on the bus and headed for the church of La Sagrada Familia. 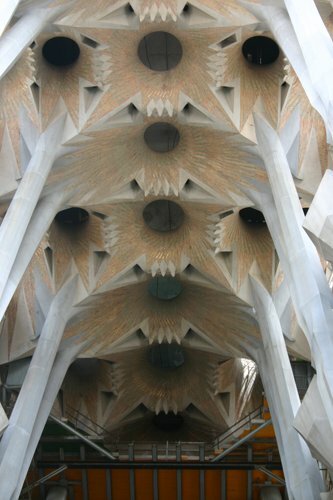 Gaudi was a very religious man, and he himself designed the East door, the Facade of the Nativity. This is a paen to life and joy, the rising sun and new life. 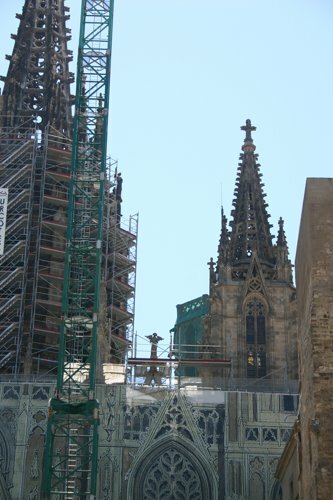 Gaudi left plans for a lot of the church but the facades were not designed. 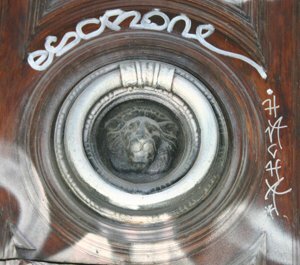 He wished each generation to leave its own artistic and architectural mark on the cathedral. 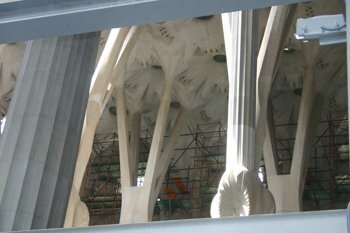 Gaudi designed the athedral to have 18 towers, of which 8 of the 100metre towers for the 12 Apostles have been completed. 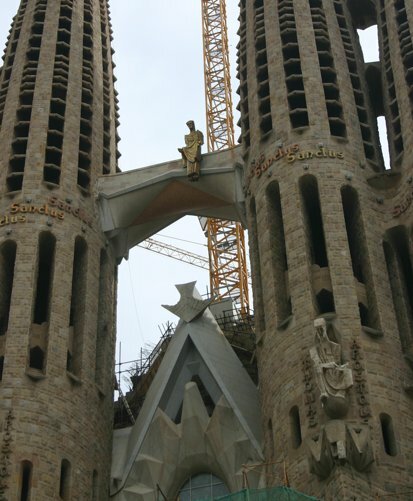 The 2 tallest still remain to be completed, the towers for Jesus (170m) and Mary (125m) and also those for the 4 Evangelists. 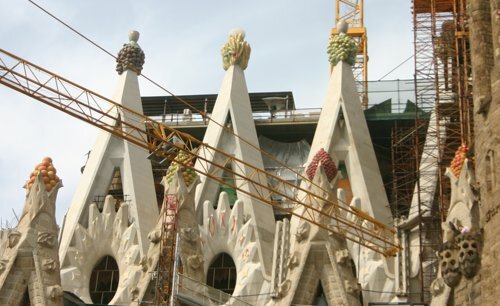 To the left of the East facade is a series of towers, representing the wealth of Barcelona, grain, grapes and fruit. These have been created by the Japanese artist, Etsuro Surtoo. When separatists smashed part of the Facade of the Nativity, ruining several statues, Surtoo repaired them, giving some of the little angels a japanese cast to their features. 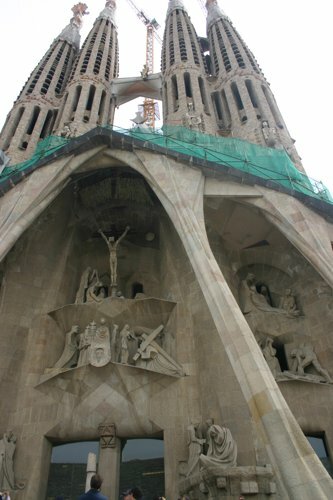 The West facade has been finished also, and it is the facade of the Passion, a paen to sorrow, pain and suffering. 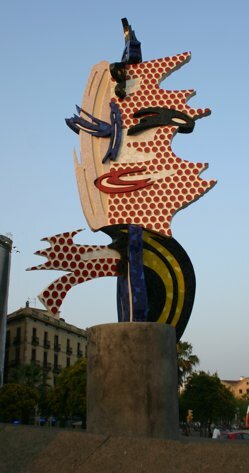 The artist, Josep Maria Subirachs, insisted on artistic freedom, and has used a cubist style. 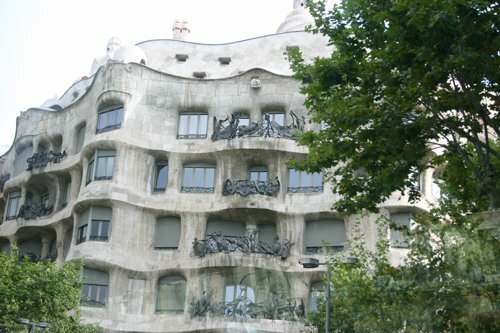 The Roman soldiers on this facade have helmets exactly like the turrets on the roof of Casa Batllo, a tribute from the artist to Gaudi. The faceless woman in the centre is the Veronika who followed Christ and who is also every(wo)man. 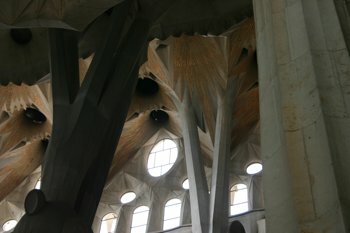 Gaudi designed the interior to mimic the arching style of trees. 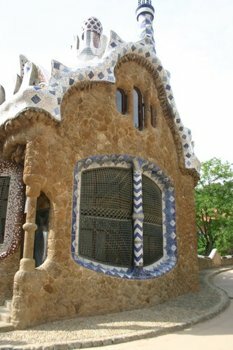 He didn't like the ogive arch found in gothic cathedrals, so looked at nature for inspiration - this is one of the fundamental tenets of Modernista architecture - form, function, beauty. 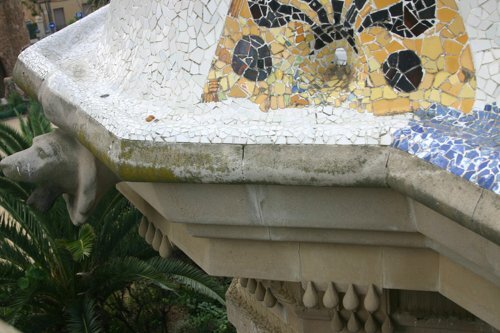 the peace symbolism is an echo of the tree of peace with doves which Gaudi created and situated between the towers of the East facade. 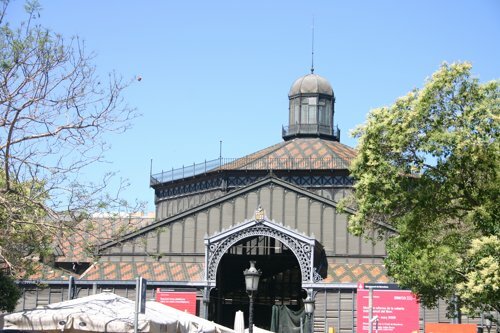 We rerturned to the plaza Catalunya and walked down the Ramblas, looking at the small animals and birds for sale. 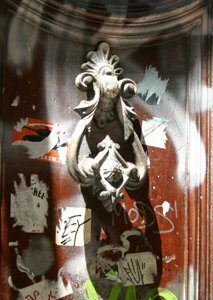 We then lunched in the Bari Gotric, at the tapas bar that was full a couple of nights ago, the Teller de Tapas. 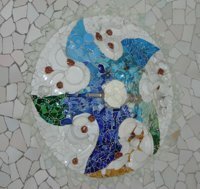 Do seek this out if you go to Barcelona, as the tapas is delicious and unique. 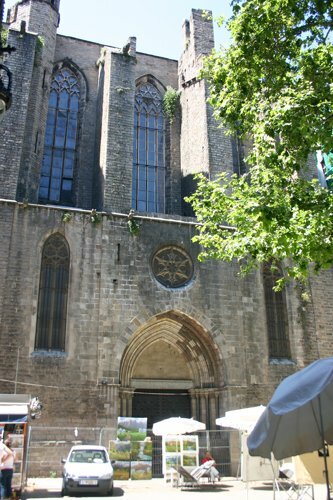 It's behind the church of Santa Maria del Pi. 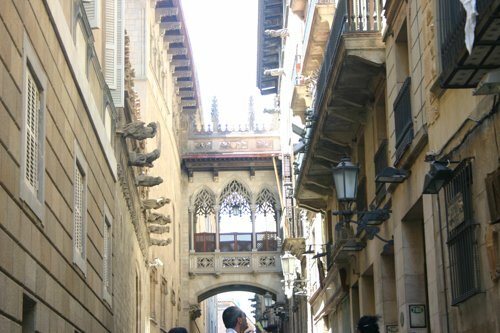 We then decided to walk to the Palau de Musica Catalunya, as the guidebooks recommend it. 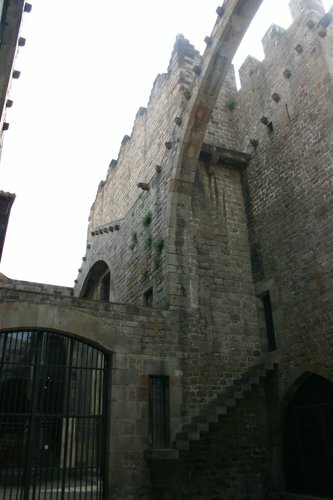 We arrived just after 5.30 and found that the last tour was at 6 and there were spaces on it, so we hurriedly booked. You can only see the inside either by tour or by attending a concert there. 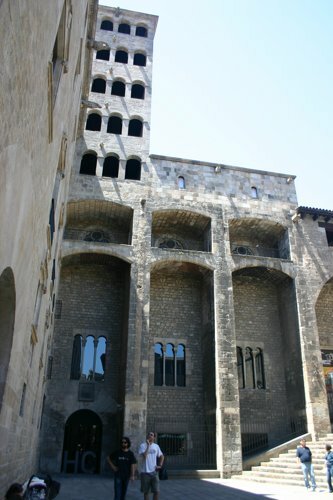 The Palau is the home theatre of the Barcelona Orfeo, a choir group, and is privately owned. 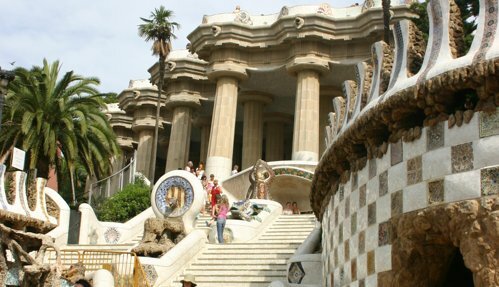 It costs 10E to take the tour, but it is worth it, in my opinion. It is absolutely stunning. This is one of those tours that so many countries do so well. You begin by taking a seat in the choir rehearsal room and watching a video about the Palau and the people who have performed there and about its creation. 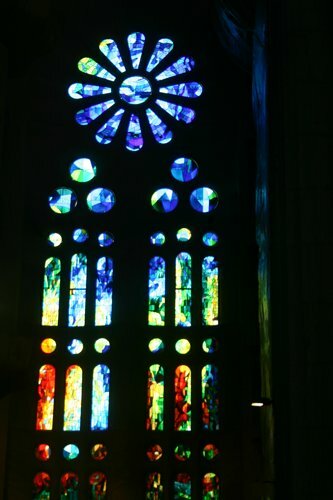 After that, you visit the different levels of the theatre, and rooms off the main hall, and hear the organ play to get an idea of the acoustics, and get a full English talk about the symbolism of the glass art. It is spectacular. 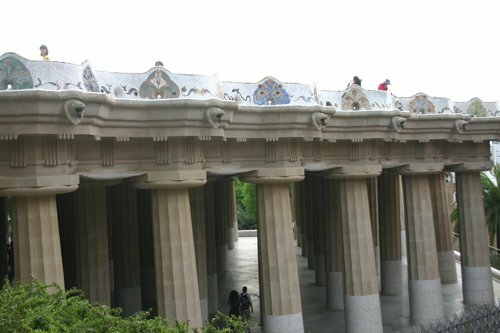 The artist was a contemporary of Gaudi, and thus the mosaics used on the columns on the terrace above strike a familiar chord, but the similarities end there. 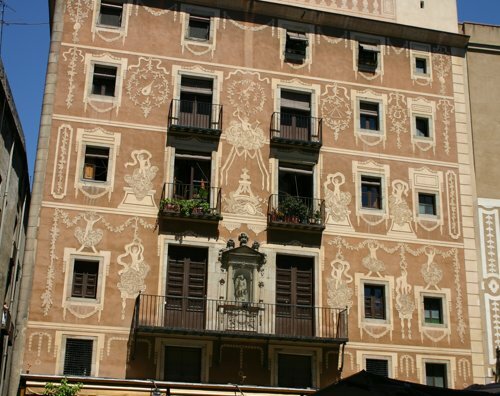 Domenech Montaner didn't hate straight lines, nor did he object to using styles of earlier times. 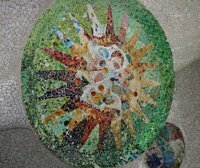 The roof has a beautiful light made of mosaic glass wich catches the sunlight and reflects it into the theatre, the walls echo this theme with sunbursts of coloured glass. 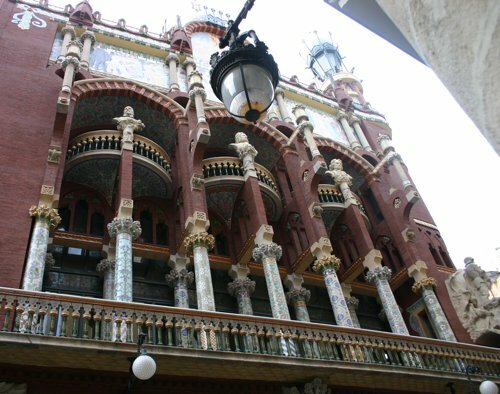 The website has alas very few photos of this stunning theatre - if you visit Barcelona be sure to include it. Back again to Set Portas for dinner. I had the best gazpacho ever, a rich cold tomato soup accompanied by a plate of small dishes of chopped tomato, chopped green capsicum, cucumber, onions. I then had the roasted lamb, falling off the bone very flavourful lamb, and J had the rich man's paella, where all the prawns were peeled and the mussels shelled. Very tasty and rich. JP had the escalope of veal which was so tender. Another bottle of the delicious calatunya rose to wash it down with. Home for our last night in Bacelona. 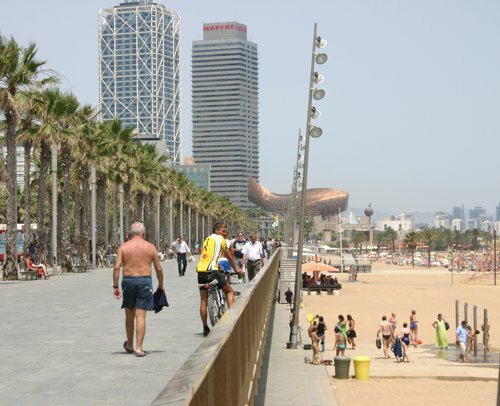 We walked back through the suburbs of Barceloneta and the beach until we had reached the column of Columbus again, then crossed the road to the Naval Museum. 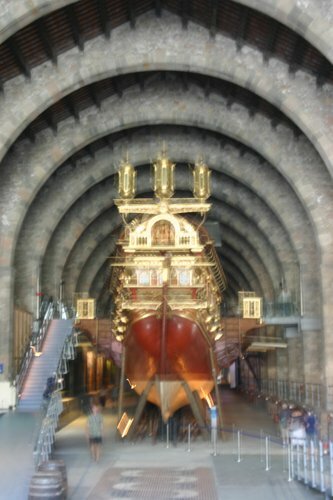 This is housed in the old royal shipyards, a magnificent building. Sadly, this picture doesn't do it justice. This museum is great value because not only are the audioguides free, they are on a mobile phone. The audioguide is called The Great Sea Adventure because it isn't a dry documentary, it's live theatre!! 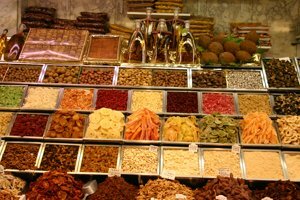 The galley slaves are complaining about the hard work and the smell, the shipwrights are talking about draught and currents, the merchants are talking about spices. Very entertaining indeed. Back out into the sunshine (very hot again!!) and home for a rest. Tonight we ate at Set Portes, or 7 doors, one of the oldest restaurants in Barcelona, and highly recommended by tourist guides and the friends with which we had dinner a few nights ago. 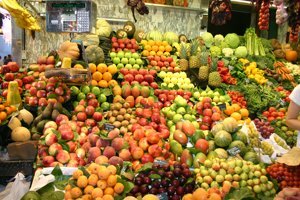 The food is very nice indeed, and one can eat cheaply or at the top of the card. JP had asparagus with 3 sauces, whilst J and I shared the antipasto plate, which contained calamari, octopus, potato torta and many other deliccious things. JP and I split a veal steak with chips and a lasagne of meat with truffles, and J had the dorade. Very nice indeed. A long walk home to walk off our over-indugences!!! they all know when to lift hands and change steps. 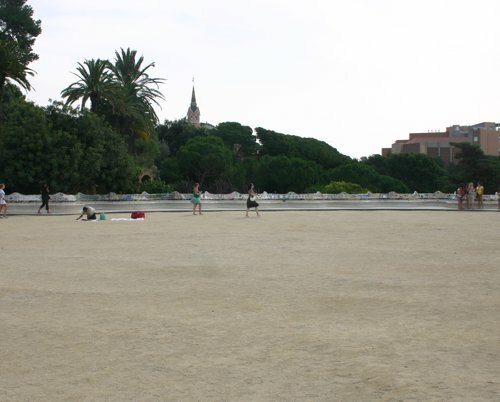 All around the square are rings of between 8 and 12 people. 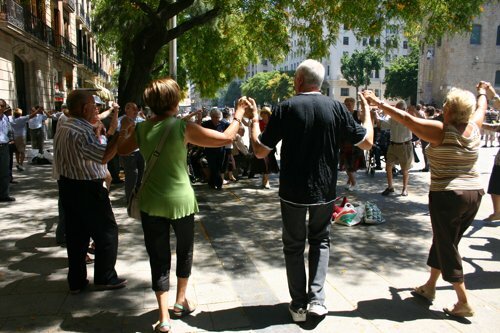 As someone wants to join they leave their belongings in the centre of the circle, take hold of their neighbours hands, and begin the dance. We saw one elderly fellow teaching a young english girl the dance steps. 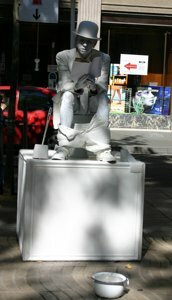 We later found out that this ihappens every Sunday in the square. 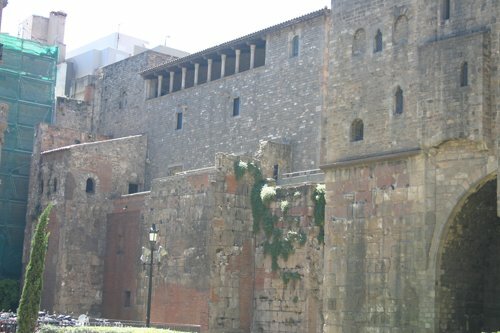 and around into the Placa de Sant Jaume. At the end of the alleyway is the old bishop's palace which was also once the church council meeting rooms, and it now houses an underground city, the roman houses and early church buildings that were on this site. because of course there were no photographs allowed inside. It's an amazing place, part of a city laid out under your feet crossed by glass walkways and with fabulous free audioguides. 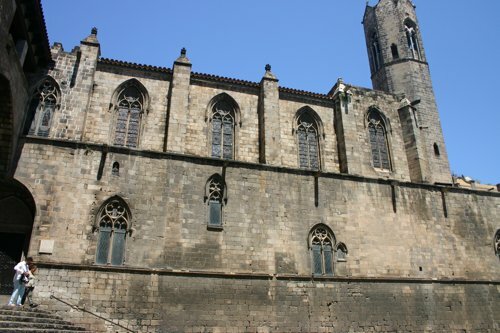 There were wine-making places and wine stores, places where fish was salted in baths and fish-sauce made of the fish offcasts, a dying workshop, houses, an early church, and the later episcopal palace that was build over the top. Fascinating, and very well done. 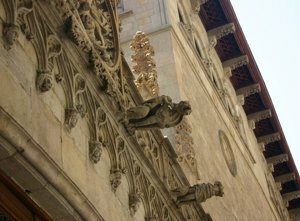 the houses around it are decorated with a wealth of gargoyles, statues, carved frescoes, carved window lintels - its a visual feast. 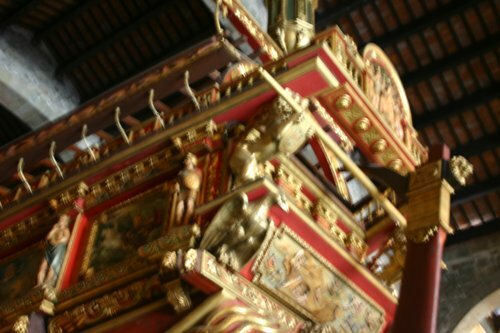 Its ceiling is painted and carved wood, and the arches are also carved intricately. 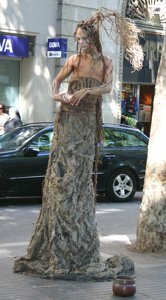 People were playing music in the streets, and it echoed beautifully amongs the walls and alleys of the Catherdral. 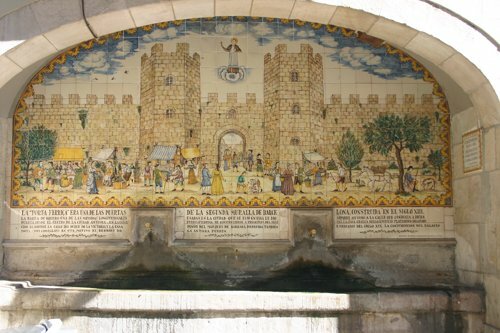 Next we headed towards il Born, named after its main street, also known as la Ribera. Its an old district that has been snapped up by yuppies and is now very chic with lots of lovely boutiques and shops - luckily it was Sunday and they were all shut! 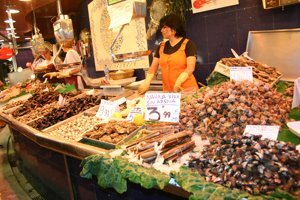 We walked as far as the mercat Santa Caterina, which closed at 1 and were were there around 2. It was very hot, in the high 30's, so we stopped for a drink, then walked back to the hotel for a rest. We'd been out walking for over 6 hours! Dinner at a little paella place behind Santa Marie del Pi in the Bari Gotic. JP and I shared a Crucicoques, which is like a pizza only a different dough, extremely tasty, and a chicken paella. J jad the seafood one. Pretty ordinary paellas, made for tourists. J then went back to watch the soccer semi-final, and JP and I had another glass of wine before going back also. 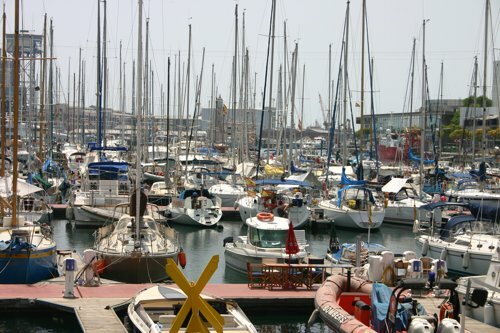 We left Port Cassefieres and headed towards Barcelona, a trip of around 4 hours. After a motorway stop for lunch (note: the italian motorways have better food and a wider selection than the French or Spanish, and indeed more than some French restaurants! 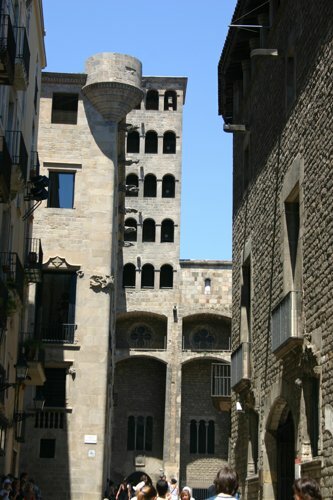 ), where we bought a map of Barcelona and the smallest roadguide to Spain we could find, we managed to negotiate our way to the hotel Principal, just 2 blocks off the Ramblas. There is a car park opposite so the little Peugeot is going to sit in there for 4 days. The hotel is amazingly central. The rooms are nice and clean, smallish but that's OK. A TV for J to watch Euro2008 on. However, we later find that the walls are made of paper and since the floors are tiled, every footstep, conversation, wheeled trolley and argument can be heard. Very hard to sleep when people are arriving at all hours of the night. Sigh. 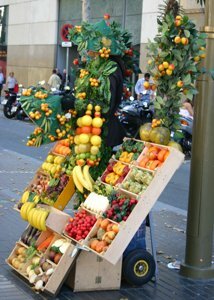 The first afternoon we walk down the Ramblas to the market that is there every day near the column of Columbus, at the sea side of the Ramblas. 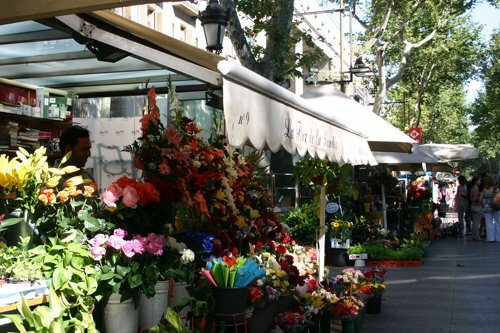 We then walked down to the Bouqetaria market, the large food market in the centre of town. 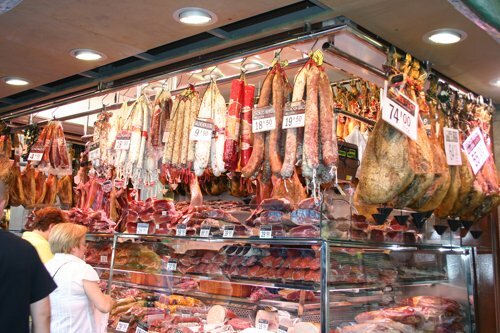 First stop, the jamon stall for a taste of jamon iberica grand - at 150E a kilo!!!! We met up with my nephew and some friends, and had a dinner where the company far far exceeded the food, by leaps and bounds. A lovely night indeed in a magical city.